4 Bedroom Detached House For Sale in Manningtree for Asking Price £500,000. Following a conversation with the vendors they have asked us to state, in their words, the following; "The village of Bradfield is a delightful, unspoilt and active village that has two halls with clubs and community group meetings, two pubs, post office store and delightful school. As an added benefit, Bradfield nestles alongside the river Stour with its own tidal beach for quite relaxation and walks along the Essex way. 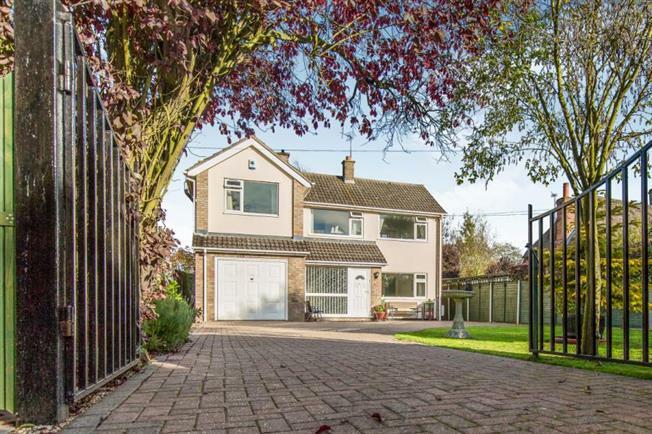 Nestled in the centre of this village is this exceptionally well presented four bedroom fully detached property that has been enhanced by the current owners to include extra land to the rear and solid construction expansion for added living space. The property is unique in being set well back from a quiet road with gates, and is situated in 0.3 acres (sts) and all around established privacy boundaries, which also boasts meadowland and rolling field views at the rear. Given the current owners work from home the property also has an additional large size Scandinavian style outbuilding in the grounds with services connected allowing a tranquil work setting, or place for relaxation which is set back among the beautiful rear gardens. Transport links include: Catchment transport to nearby secondary school, Bus route, nearby rail links to neighbouring towns and the capital and easy road access to A120, A12 & A14. Dedham vale is a short drive and considered an area of outstanding natural beauty. Flatford Mill & Alton water are also nearby." Council Tax band D.
Double glazed door leading to the entrance hall, obscured double glazed window to the front, stairs leading the the first floor accommodation, wall mounted radiator. Obscured double glazed window to the side aspect, low level WC, wash hand basin. Double glazed window to the front aspect, double glazed patio doors to the rear, leading to the garden. Open fire place, wall mounted radiator. Double glazed patio door to the rear, leading to the garden. Double glazed stable door to the side aspect. Double glazed window to the rear aspect, double glazed door to the side aspect. Selection of wall and base mounted units with a roll top work surface and a one and a half sink and drainer. Built in double oven and hob. Space for a washing machine and a fridge. Double glazed window to the rear aspect, wall mounted radiator, built in airing cupboard. A well matured and maintained garden benefiting from a summer house with power and a metal shed. Patio area with the remainder being laid to lawn, fence and hedge enclosed boundaries with views over the meadow behind. There are two side gates, either side of the property leading to the front driveway that is block paved, the remainder is laid to lawn. There is a double gate at the end of the driveway.